You know how it is, you are having a bad day and you see no way of salvaging it. So life has handed you lemons today but rather than throwing up your hands and abandoning the whole thing try using one of these phrases to change the situation and see if you can sweeten up the day. “Yes.” Just say yes. Don’t worry about the mess or inconvenience just bring some joy into the house with a big, enthusiastic yes (fake it if you have to). Say yes to a quick trip to the park, or pulling out the play-dough. Say yes to mudpies and glitter or ice cream for dinner. We become so accustomed to saying no reflexively that we squash many opportunities to relax and enjoy our children. If you are having a bad day try saying yes to some silliness. “What a great idea”. You want to raise children who think, who are creative and who have ideas about many, many subjects. Ask for their ideas and praise the good ones. If you are having a bad day the children might have an insight as to why and how it can change. Encourage “out of the box” thinking. One of the beauties of homeschooling is that the children learn to think for themselves and they become excellent problem solvers so if the mood is low ask the kids what you can all do to solve the problem. “You can do this”. When struggles happen, and they do, if your children know that you believe in them, it lightens the load. Don’t give them the eye roll or despairing look. Just smile and know that your confidence in them will help them get there. “I’m proud of you”. We all need to use this one more. You’re kids are great (mine are too) and we need to let them know that we are proud of their efforts and accomplishments. Even the very small everyday ones. Did someone make themselves a sandwich and clean up? Proud. Did someone do a lovely job on an essay. Proud. Did someone help a younger sibling? So proud. Say it at every opportunity and the kids will strive hard to continue hearing it. “Mistakes happen.“ Not every idea is a good one and sometimes things just go wrong. Or they make bad choices. Before blowing your stack, take a deep breath and count to five (you may not have time for ten) and say it, “mistakes happen, what should you do now to fix it?” Then work with the child to formulate a plan. When they are young usually a mop and some cleaner fixes mistakes. When they are older things are more complex but a child who knows that you are in their corner even when you are angry will never hide their mistakes from you and will come to you when things go wrong in their life. “I was wrong.” See number 5. We all make mistakes and when we parents are wrong, we need to admit it and make it right. If for no other reason than it sets a good example. Take another one of those breaths, say you’ve made a mistake, fix it and move on. “Let’s figure it out together.” When a child is frustrated and unhappy, when the math isn’t coming together or a project just won’t gel then it’s time to step in, give support, supply some ideas and expertise. 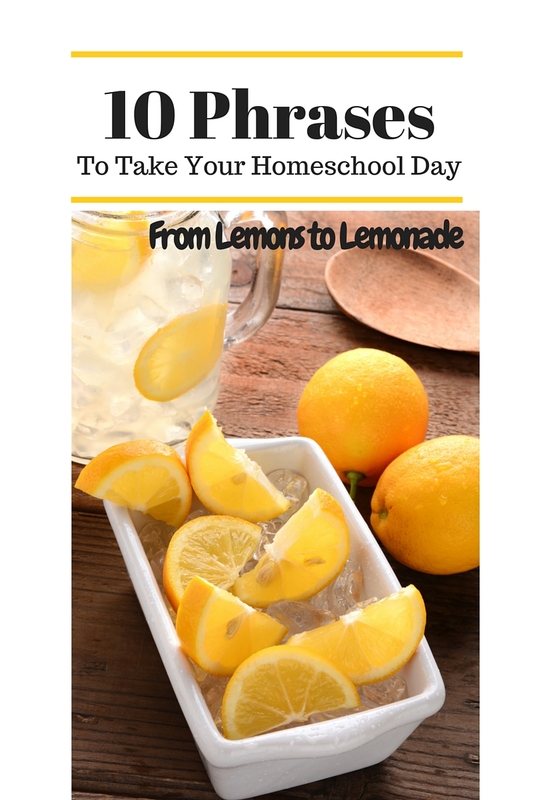 We all need help sometimes and homeschool moms tend to think their kids can do everything on their own. Kids are kids and they all need help sometimes. “Help me to understand…” A much better phrase that “why are you making everyone in the house miserable?” Help me understand why; you’re in such a mood, you made that decision, you can’t decide what do do, what the trouble is…. You get it. “You are so good at….” Everyone needs a little positive reinforcement. It can be as simple as a compliment about how the child loads the dishwasher. Give each child at least once compliment a day and suddenly the day doesn’t seem so bad. “I love you.” At the very least say it in the morning when they wake up and in the evening before they go to bed. Whisper it in their ear when they are near you, pair it with a hug when they leave the house, say it when you are so angry you can’t think straight. Those three words have the power to transform the world, if only we used them more. God loves us all, especially when we are most unlovable, so why not emulate that love and proclaim it as often as possible? Children that know they are loved are happy children even when the day goes off the rails.